At the heart of a sustainable future, inexpensive electrical energy needs to be guaranteed to all people on this planet. Photovoltaics bear the potential to generate the required amount of electrical energy at low cost by harvesting the globally available and inexhaustible energy resource of the sun. To speed up the global widespread use of solar cells, their economic costs need to decrease and efficiencies need to increase. In our group, we work on advanced optics and novel materials for low cost and high efficient next generation perovskite photovoltaics. A key strategy to reduce the economic costs of next generation photovoltaics is to enhance their potential to absorb incident solar radiation and transform it into electrical energy. Our group designs, develops and prototypes novel optical concepts for improved light incoupling at the front side of the solar module as well as light-trapping concepts that allow all incident light to be guided and absorbed efficiently in the solar cell. Nanophotonic electrodes make use of the full potential of periodic or quasiperiodic 3D-nanostructured materials to control the spectral and angular light propagation. They can be used to improve light outcoupling in LEDs as well as light incoupling and light management in solar cells. Elementary concepts make use of nanophotonic electrodes and intermediate layers/electrodes which effectively match the refractive index of the substrate and the absorber layer. This is achieved by a careful design of nanostructures of dimensions below the wavelength of light. Advanced concepts explore complex nanophotonic effects, as apparent for example in photonic crystals as well as diffractive elements, in order to enhance further the light transmission and tune the spectral and angular selective response. For example, inverted opals serve as photonic crystals and enable spectral selective transmission as well as light diffraction. The development of these nanophotonic electrodes bears large benefits and cross-fertilization for a number of related technologies such as light extraction in light emitting devices (LEDs), thin-film solar cells, optical sensors and detectors and semitransparent photovoltaics. Figure: Photograph of the front side of prototype perovskite solar cells with nanophotonic front electrodes. The five areas with decreased brightness indicate the regions of the nanopatterns of the ITO front electrode. The light diffreaction at the nanopatterned electrodes is apparent by a colored haze. Nature’s evolution provides a broad range of concepts and solutions to technological challenges. The living organisms have evolved well-adapted structures and materials to secure their survival over the years. Inspired by biological solutions, great technologies have been developed in the last centuries. Paramount light harvesting can be found in the plant and animal kingdom. The textures of petals of various flowers show unique light harvesting properties. Different flower textures have been investigated for photovoltaic applications. In a recent study, our group has investigated the exceptional hierarchical nano/micro texture of the viola petal. Hereby, we demonstrated a 6% improved performance of a silicon solar cell coated by the viola texture. The gain is based on a broadband decrease in reflection losses at the air/encapsulant interface. This strong light incoupling effect by the hierarchical viola texture is supported by retro-reflection properties which further enhance the harvesting and utilization of light by the solar cell. Since the findings are based on optical effects, this is not only limited on silicon solar cells, but also applicable to other technologies, where reflection losses are present. In order to extract efficiently the gernerated photocurrent of a solar module, up to 10% of the surface area is either covered by so-called contact fingers and bus bars or interconnection lines. Both contacting schemes reduce the power conversion efficiency, since incident light on these surfaces cannot reach the active area of the solar modules. Our group works together with colleagues at the APH on novel concepts that guide incident light around front contact grids and interconnection lines of solar modules via so-called invisibility cloaks. So far, the used fabrication techniques, e.g. 3D laser lithography and UV-imprinting processes, limit the size of the device to small scales. It is a Thus, the main research interests are the large-scale fabrication and the integration of the cloaks into commercially available single- and multi-junction modules. Figure: Schematic illustration of the working principle of the invisibility cloak which guides sunlight past the contacts to the active surface area of the solar cell. (Graphics: Martin Schumann, APH, KIT). Light trapping in solar cells is about increasing the absorption of light for wavelengths for which the intrinsic light absorption of the photovoltaic material is only poor. Essentially a solar cell is waveguide, different concepts exist for coupling light into optical modes traveling in this waveguide. One of these concepts is the use of photonic crystals for diffracting light and sending it along long paths through the photovoltaic active material. Direct laser writing can be used to structure such a photonic crystal in a versatile manner. By use of solution based semiconductors, such as copper indium selenide (CIS) nanocrystals, the direct laser written structures can be infiltrated and a photonic crystal structured solar cell waveguide is formed. Soiling of PV modules decreases their electrical output and increases their operational cost of PV installations. To address this issue, we are investigating the use of bio-inspired self-cleaning cover layers. By nano-/micro structuring the surface of polymers, it is possible to achieve superhydrophobicity leading to self-cleaning functionality. At the same time, by optimizing the aspect ratio of the nano/micro structures, reduction of reflection and better light management can be achieved, leading to higher energy conversion efficiency. Figure: A water droplet on a structured fluoropolymeric layer exhibiting a contact angle of >160°. Perovskite thin-film photovoltaics can dramatically reduce the cost of next-generation photovoltaics. Only a few years after their discovery, perovskite solar cells have demonstrated already record efficiencies close to those of the well-established and market dominating photovoltaics. Whereas material costs are already intrinsically extremely low for perovskite photovoltaics, it is in particular the prospects of low-cost solution-based fabrication that triggers enormous expectations into this technology. 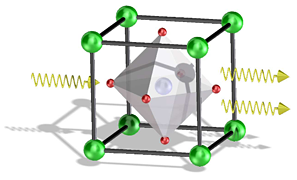 In our group, we investigate the fabrication, characterization, simulation and understanding of the device physics of perovskite photovoltaics. The research on perovskite photovoltaics is highly entangled in a joint research taskforce on perovskite photovoltaics with our colleagues at the Light Technology Institute. Within the framework of KIT and the exceptional cleanroom facilities at IMT and LTI, we research and develop novel materials and device architectures for high efficient perovskite solar cells. The process involves fabrication techniques like spin-coating, atomic layer deposition, electron beam deposition, sputtering and evaporation of different materials. Characterization of such fabricated devices is carried out using solar simulator, external quantum efficiency measurement setup, scanning electron microscopy, 4 point-probe measurement, UV/Vis spectrophotometer and X-ray diffraction. Figure: (a) Precursor solutions for the fabrication of perovskite solar cells. (b) Inkjet printed perovskite layer in the shape of the KIT logo. (c) Scanning electron microscopy image of a multicrystalline perovskite layer. The unprecedented rise of perovskite thin-film solar cells in recent years has opened up a novel route to advance the power conversion efficiency of established photovoltaic technologies. For the first time, a low cost and wide bandgap thin-film PV technology is available that can be combined with established low bandgap semiconductors, such as crystalline silicon (Si) and copper indium gallium diselenide Cu(In,Ga)Se2 (CIGS), in a multijunction device architecture with the potential of surpassing efficiencies of 35%. Considering that the current world record efficiency of the market-dominant crystalline silicon solar cells is 26.3%, perovskite/Si multijunction solar modules and perovskite/CIGS multijunction solar modules offer great promise for a disruptive change in the photovoltaic market. The key advantage of such a multijunction solar module lies in the efficient exploitation of the solar spectrum. The high energy light is harvested at high efficiency in the perovskite top solar cell while the low energy light is harvested in the silicon bottom solar cell. With our research partners, we research, develop and prototype high efficient multijunction perovskite/Si solar cells and perovskite/CIGS photovoltaic solar cells. Figure: First ever prototype perovskite/CIGS solar module reaching a power conversion efficiencies of 17.8% with a fully scalable interconnection scheme. Contact: Dr. Ulrich Paetzold, See also our recent press release. The key challenge hindering the way of Perovskite solar cells towards commercialization is their compromised stability for prolonged light exposure, humidity and temperature stress. The aim of this project is to enhance the stability as well as efficiency of Perovskite solar cells. For example, we research luminescent downshifting for improved stability of perovskite devices towards UV-light induced degradation. In order to withstand environmental conditions suitable encapsulation layer will be employed to protect from humidity. We collaborate closely with the Light Technology Institute at KIT to investigate the potential of perovskite semiconductors as a laser gain material. Our first results published in Applied Physics Letters (http://scitation.aip.org/content/aip/journal/apl/109/14/10.1063/1.4963893 ) show that perovskite layers solution cast onto nanoimprinted gratings make stable distributed feedback lasers with thresholds around 120 KW/cm2. Figure 1: Schematic representing stimulated emission of photons in a perovskite structure.